On its second flight, SpaceX’s mammoth Falcon Heavy rocket hurled an Arabsat communications satellite the size of a school bus nearly one-quarter the way to the moon Thursday, days after NASA’s administrator identified the privately-developed rocket as a backup to the agency’s behind-schedule Space Launch System for sending astronauts back to the lunar surface. The Falcon Heavy launched a satellite for a paying customer for the first time Thursday, 14 months after SpaceX debuted the rocket on a test flight that sent a Tesla sports car into the solar system. In another first, SpaceX recovered all three of the Falcon Heavy’s first stage boosters after Thursday evening’s launch — two back at Cape Canaveral and one on a landing vessel in the Atlantic Ocean. 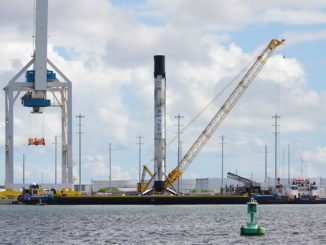 The core stage on last year’s inaugural Falcon Heavy rocket crashed during a landing attempt at sea. Weighing some 3.1 million pounds (1,420 metric tons) fully fueled, the Falcon Heavy fired its 27 Merlin main engines in the final seconds of Thursday’s countdown, shooting a plume of exhaust out of the flame trench at pad 39A, the site where all of the Apollo moon landing missions left Earth at NASA’s Kennedy Space Center in Florida. Moments later, the Falcon Heavy rose from the seaside launch complex at 6:35 p.m. EDT (2235 GMT). A flickering trail of orange flame followed the rocket into a clear evening sky as the Falcon Heavy — the world’s most powerful operational launcher — arced toward the east over the Atlantic Ocean with more than 5.1 million pounds of thrust, rattling windows across the Florida space center. Besides being the Falcon Heavy’s commercial debut, Thursday’s launch was also the first Falcon Heavy to fly with upgraded “Block 5” boosters, which produce more thrust and feature changes to make the rocket easier to recover and reuse. Block 5 boosters have flown on Falcon 9 missions since last May. Two-and-a-half minutes into the flight, the Falcon Heavy’s two side boosters — each equivalent to a Falcon 9 rocket’s first stage — jettisoned and flipped around using cold gas nitrogen thrusters to fly tail first. 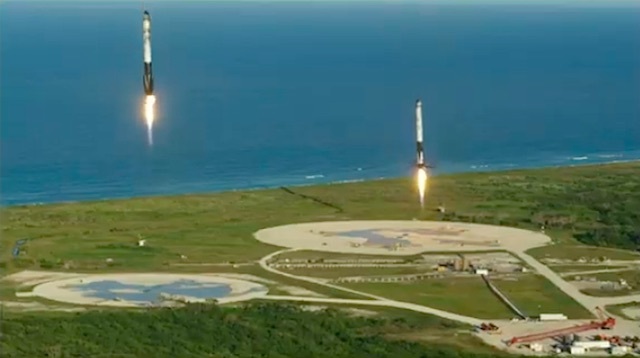 After the high-altitude pirouette, the boosters reignited their Merlin engines and began thrusting back toward the Florida coastline. About a minute later, the Falcon Heavy’s core stage shut down and dropped away from the rocket’s second stage. Like the side boosters, the center core began maneuvering for a re-entry back into the atmosphere, but it targeted SpaceX’s drone ship “Of Course I Still Love You” parked at sea 615 miles (990 kilometers) east of Cape Canaveral. The twin side boosters their engines to brake for nearly simultaneous returns to SpaceX’s concrete landing pads around eight minutes after liftoff, descending to on-target touchdowns a few hundred feet apart as two double sonic booms from the rockets rocked the Space Coast. Meanwhile, the core stage survived a higher-speed re-entry and nailed a landing on SpaceX’s drone ship around 10 minutes into the mission, making the company three-for-three in retrieving the Falcon Heavy’s three boosters. The rocket landings put on a dazzling and unique show for thousands of spectators who gathered around Cape Canaveral to witness the launch. No other rocket currently in service lands its boosters for reuse. 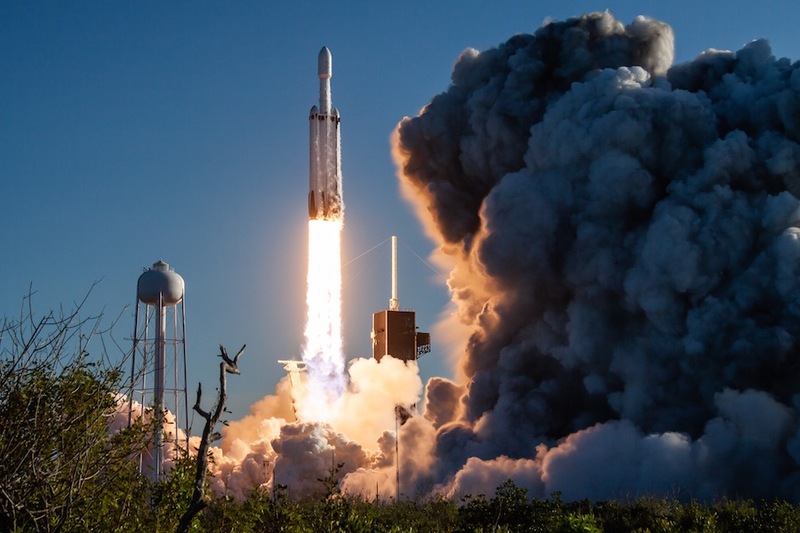 The primary objective of Thursday’s mission was the injection of an Arabsat communications satellite into orbit, a job that required two firings by the Falcon Heavy’s upper stage. After the upper stage’s first burn, the rocket coasted across the Atlantic and reignited its single Merlin engine for nearly 90 seconds to propel the 14,252-pound (6,465-kilogram) Arabsat 6A spacecraft into an elliptical “supersynchronous” transfer orbit that ranged nearly 56,000 miles (90,000 kilometers) above Earth, with a low point less than 200 miles (300 kilometers) in altitude. 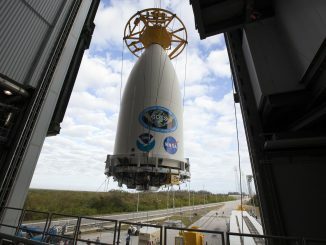 The rocket released the Lockheed Martin-built payload 34 minutes after liftoff in an orbit inclined 23 degrees to the equator. Lockheed Martin officials said the ground team controlling the satellite acquired the first signals from Arabsat 6A soon after launch, confirming it was alive and healthy after arriving in orbit. Arabsat 6A will use its own engine to guide the satellite into a circular geostationary orbit more than 22,000 miles (nearly 36,000 kilometers) over the equator, the perfect altitude to allow its velocity to match the rate of Earth’s rotation. SpaceX’s Falcon 9, which uses a single first stage, could have launched the Arabsat 6A satellite into a lower transfer orbit, but Arabsat booked a Falcon Heavy flight in 2015, before SpaceX introduced new Falcon 9 models that expanded its lift capability. With the extra energy of the Falcon Heavy, the Arabsat 6A satellite was deployed in a much higher orbit, reducing the time the spacecraft needs to consume to maneuver into its final operating position. Falcon 9 rockets launched a pair of Telstar communications satellites, both heavier than Arabsat 6A, last year, but those spacecraft were released into lower, less ideal “sub-synchronous” transfer orbits. In a fully reusable configuration, assuming side booster landings at Cape Canaveral and a core stage recovery offshore, the Falcon Heavy can deliver around 17,600 pounds (8,000 kilograms) of payload to a standard geosynchronous transfer orbit, the typical drop-off point for communications satellites destined for posts at geostationary altitude. If the Falcon Heavy did not have to set aside a fuel reserve to land its boosters back on Earth, the rocket could haul more than 15 metric tons — about 33,000 pounds — to geosynchronous transfer orbit, with an apogee near 22,000 miles. The extra altitude boost provided by the Falcon Heavy will reduce the time Arabsat 6A needs to arrive in geostationary orbit to 17 days after launch, according to Guy Beutelschies, Lockheed Martin’s vice president of commercial satellite solutions. It also saves the satellite’s fuel to potentially allow for a longer operating life, adding years to the mission before Arabsat has to buy a replacement satellite. 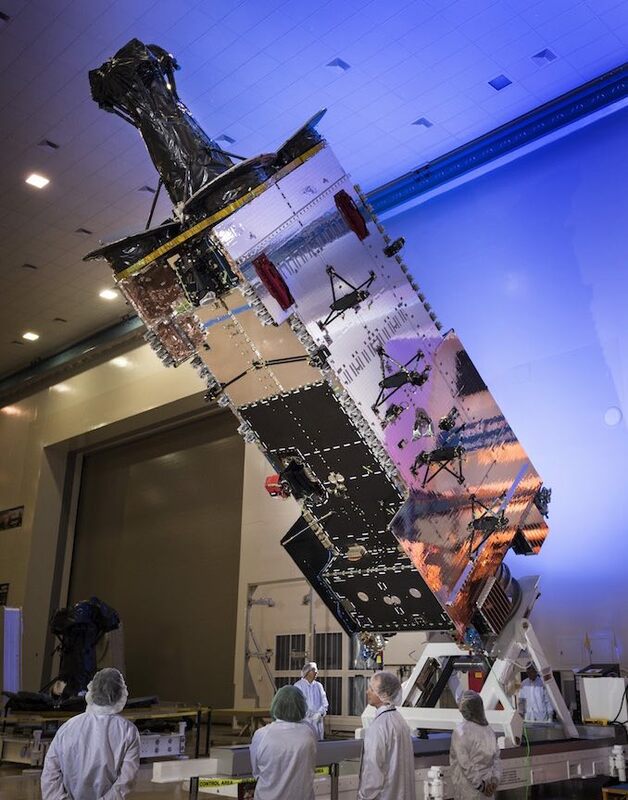 After several weeks of payload checkouts and antenna deployments, Lockheed Martin will hand over control of the satellite to Arabsat by the end May to begin the spacecraft’s expected 15-year service life. Once on station, Arabsat 6A will use four gimbaled arcjet thrusters to maintain its orbit. Arabsat 6A will be parked in geostationary orbit at 30.5 degrees east longitude to broadcast Ku-band and Ka-band signals. The new satellite will be co-located with Arabsat 5A at the 30.5 degrees east slot. Arabsat 6A is the second of three commercial communications satellites built by Lockheed Martin to launch this year. The Hellas-Sat 4/SaudiGeoSat 1 telecom craft launched in February aboard an Ariane 5 rocket, and the Japanese-owned JCSAT 17 communications satellite is scheduled for launch on another Ariane 5 flight later this year. 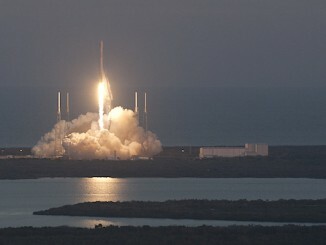 They are the first commercial communications satellites built by Lockheed Martin to launch since 2012. The aerospace contractor invested in upgrading the company’s A2100 satellite line, which is commonly used by the U.S. military, to make it more attractive to commercial satellite companies. “I think one of the most dramatic changes is we’ve got these new flexible solar arrays on-board that basically unfurl rather than having the old-style rigid panels,” Beutelschies said. “Because of that, they’re 30 percent lighter and 50 percent more power than our previous arrays. For Arabsat 6A, the one we’re about to launch, we actually have 20 kilowatts of solar array power for the vehicle. Other changes to the commercial A2100 satellite design, known as the LM 2100, include new avionics and tunable antennas. As NASA scrambles to respond to the Trump administration’s directive to land astronauts on the moon by 2024 — four years ahead of the previous schedule — the agency in recent weeks has examined backup launch options for crewed missions if the behind-schedule Space Launch System runs into more delays. The Space Launch System was designed to send NASA’s Orion crew capsule to a planned “Gateway” mini-space station in lunar orbit, where moon landers could dock for sorties to the lunar surface. But the SLS was supposed to launch in 2017, and officials last month said the heavy-lifter’s first test flight — a mission without astronauts on-board — would likely not happen until 2021. NASA Administrator Jim Bridenstine ordered a study to see whether commercial rockets could be ready in time to launch the Orion crew capsule on an unpiloted demonstration mission around the moon in 2020, untethering the new spacecraft from further SLS delays. 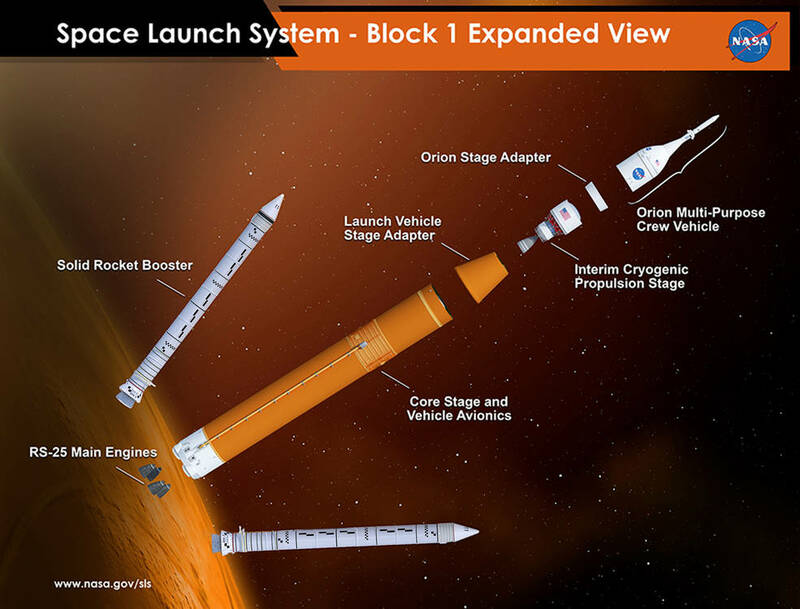 The study concluded any commercial launch option for the Orion spacecraft would likely take longer to prepare than the Space Launch System, but one intriguing backup to the SLS emerged, Bridenstine said. “At the end, there is another solution out there,” he said in a NASA town hall meeting April 1. While the Falcon Heavy falls short of the SLS’s lift capability, Bridenstine said an upper stage called the Interim Cryogenic Propulsion Stage, or ICPS, originally designed for the SLS could be installed on top of the existing Falcon Heavy. The ICPS uses a single Aerojet Rocketdyne RL10 engine and is built by United Launch Alliance, a SpaceX rival. “Talk about strange bed fellows,” Bridenstine said, referring to the possible marriage of SpaceX and ULA rockets. The additional stage could have the power to propel the Orion crew capsule and its service module, built in Europe, into lunar orbit. But the scenario would require numerous time-consuming modifications to the Falcon Heavy and its launch pad at the Kennedy Space Center, including additional aerodynamic testing and the placement of new hypergolic and liquid hydrogen fueling equipment at the pad. “At the end of the day, there is a solution here that could potentially work or the future,” Bridenstine said. “It would require time, it would require cost, and there is risk involved, but guess what? If we’re going to land boots on the moon in 2024, we have time, and we have the ability to accept some risk and make some modifications. In his remarks last month in Alabama, Pence put NASA’s contractors on notice, saying the moon landing objective should not be tied to any single company. The launcher is just one piece of the puzzle. NASA must also develop or purchase a human-rated lunar lander that does not exist yet. While the Falcon Heavy/ICPS launcher could be a viable alternative to the Space Launch System, Bridenstine said the SLS remains the surest way to launch astronauts to the moon by 2024. Managers at NASA and Boeing, the SLS core stage’s prime contractor, are assessing how the SLS schedule might be accelerated. The SLS first stage engine section, which will house four RS-25 main engines, has been the primary culprit for the rocket’s recent delays. Teams at the Michoud Assembly Facility in New Orleans, where the SLS core stage is manufactured, have devised a way to assemble the rest of the core stage without the engine section, allowing some work to proceed in parallel, rather than waiting for the aft propulsion module to be ready. Managers are also considering whether to skip a full-duration eight-and-a-half-minute test firing of the core stage and its four engines at NASA’s Stennis Space Center in Mississippi. The four engines are leftovers from the space shuttle program with extensive flight history, and engineers may decide that a shorter hold-down firing on the launch pad in Florida could satisfy their test requirements.